And here it is. Here they are. After spoilering bits of surprise for more than a year, finally I can reveal the whole project. It all started in May, 2016. 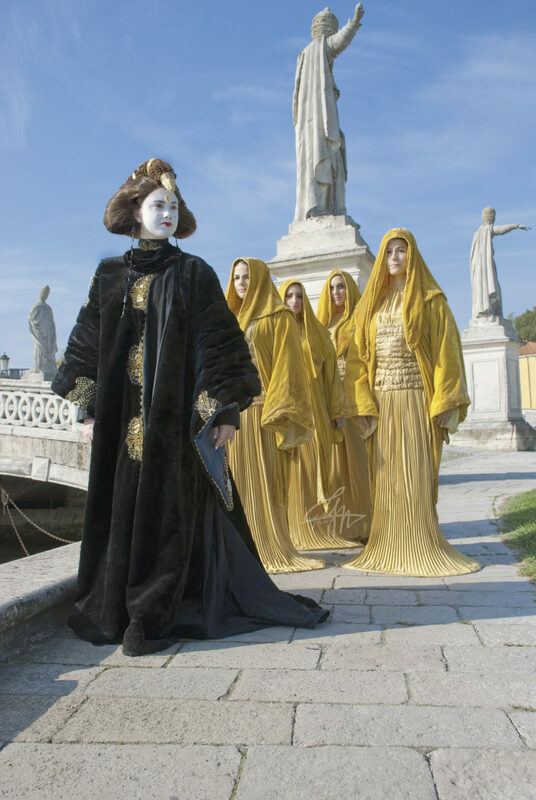 I wanted one of the big gowns, one of those scene stealing gigantic works from episode I. Hate the film, love the costumes. 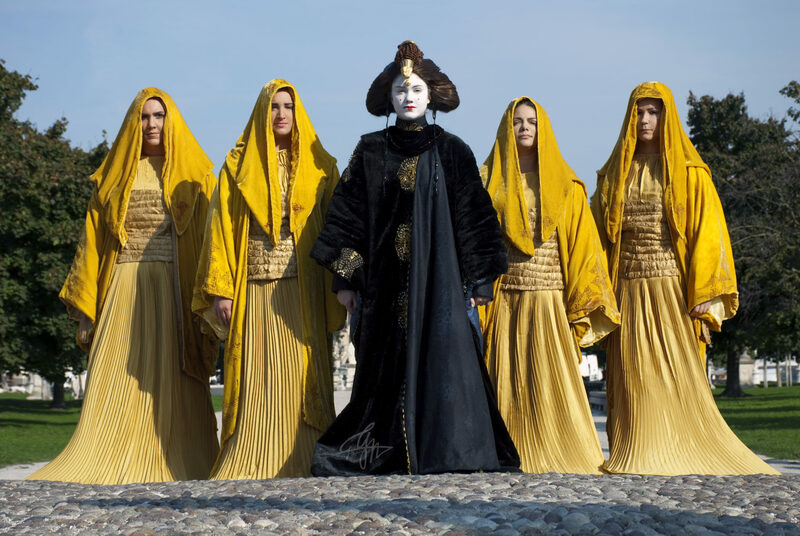 Then, the first handmaidens were lovely, but I never had the chance to see them all together again, and they were made on a budget of money and time. It was a rush, and i didn’t want to make any of the costumes that match with them. Because, if you don’t know, each handmaiden design is made to make the queen stand out and to match her gown perfectly. So you can’t just wear the flame handmaiden with a queen wearing the Red Invasion. Flame handmaidens go with the Black Invasion and with the Qui Gon Funeral gown, the eyptian looking one that never stunned me for its elegance, it looks just like a stuffed toy. 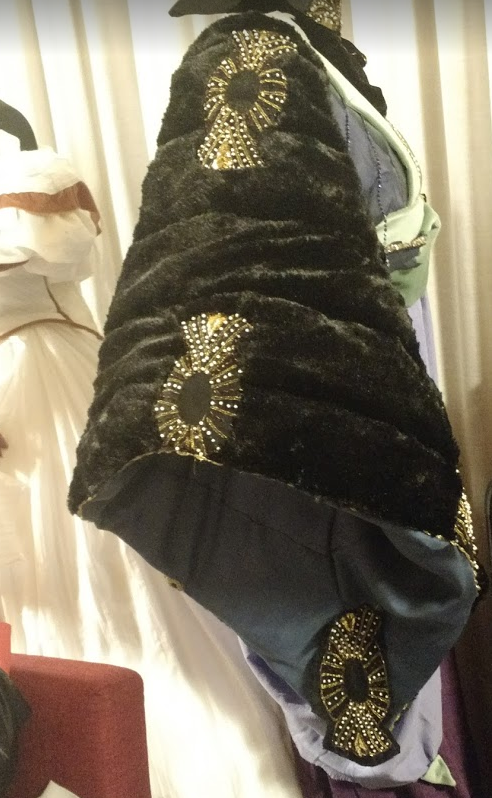 The girl who made two of the flame handmaidens, and that I worked with to unveil the curious sleeve pattern of those, suggested this, as it is one of the less made ( and later on I ame to know why), and because she totally wanted to make the golden handmaiden. 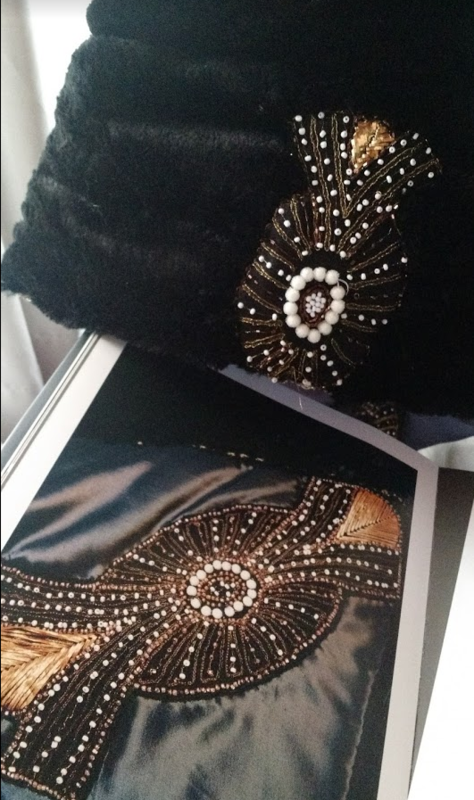 After we talked about how the costumes were to be made, I purchased the fabrics and beads. Before tha fabric arrived, we had some private problems, and I no longer worked with her. But it’s right to credit that some of the idea was hers, and some of the initial ideas on how to make the gowns came out talking together, even if most of them had to be changed in the end. 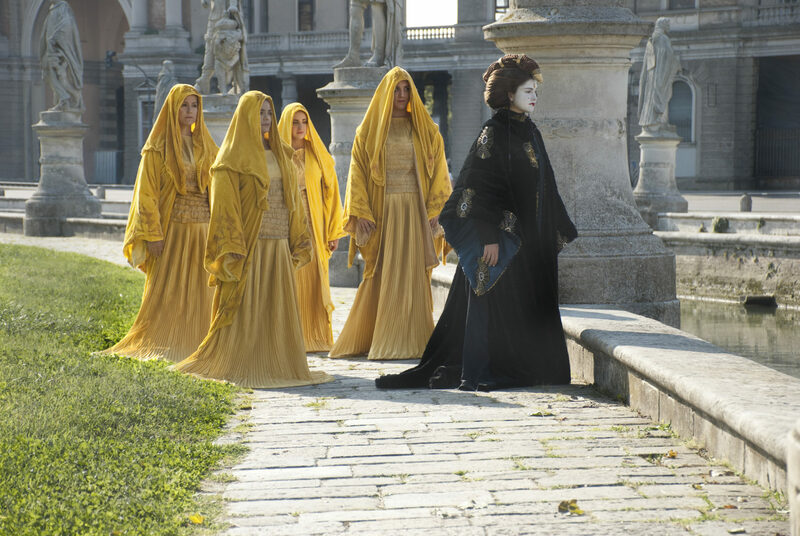 We never see more than four yello handmaidens. We see up to eight flame ones, and eight blood ones, if I am right. So we decided to make four. We had a casting. How it sounds professional. We asked some friends that could come and try the basted parts here in person, and that could afford to purchase the needed materials in some months. 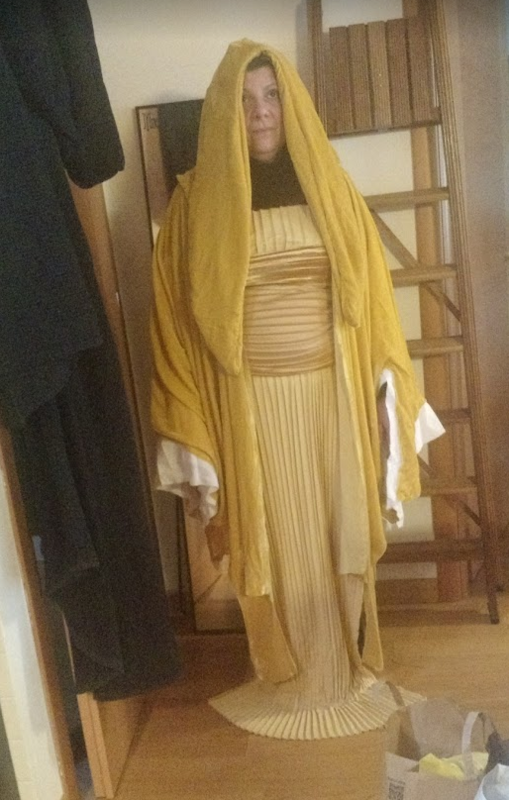 We ordered the fabrics and then me and an other friend (one of the handmaidens who was also in the flame gorup, who unfortunately could not join us for the debut shooting) made the costume. She helped me assembling and making some of the needed handstitching. She also helped me with part of the beads on my embroideries…she saved me a lot of time. Well, when I started studying the costume, I immediately saw that something was incredibly wrong. It’s a costume worn twice, first in palpatine’s office in Coruscant, and then in Naboo, at the end of the war, when talking to Palpatine. That scene was shot in Seville, if I’m right, but we have Prato della Valle, which is similar here, and it’s where we shot the pictures you can see above. There are no exhibits pictures of this. My second bible, the Padawan’s guide (first one is my beloved copy of Dressing a Galaxy), was silent. They only pointed out that the original costume was not even used on the official costumes fashion show, a replica was used, with much bigger and brighter embroideries, and different fabrics. I had a desperate need for closeups of the embroideries. It’s told that they’re parts of a 1920s gown. The whole dress has a story in the imaginary universe in a galaxy far, far away, one of the few ones to have it. It should be Cyrene silk velvet, a most preocious fabric that required a mission during a video game or an episode of the tv shows. 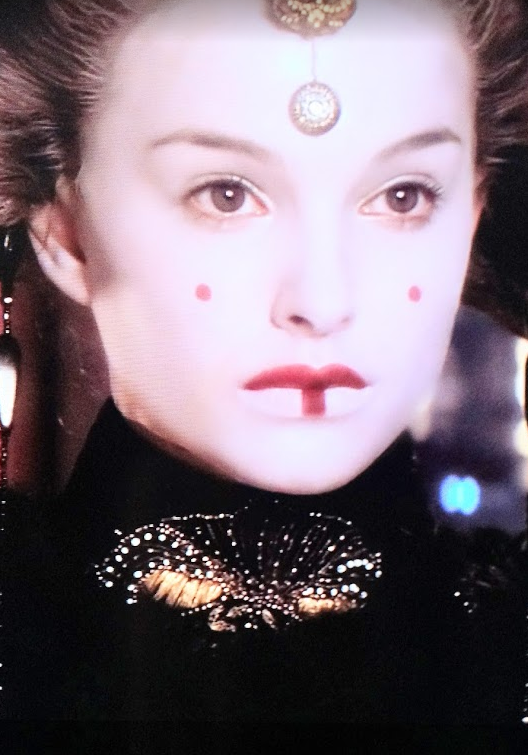 In Wookiepedia, we can read “The fluffy, black, Cyrene silk dress was accented with beaded emblems over 240 years old that once adorned a former Queen’s dress”. 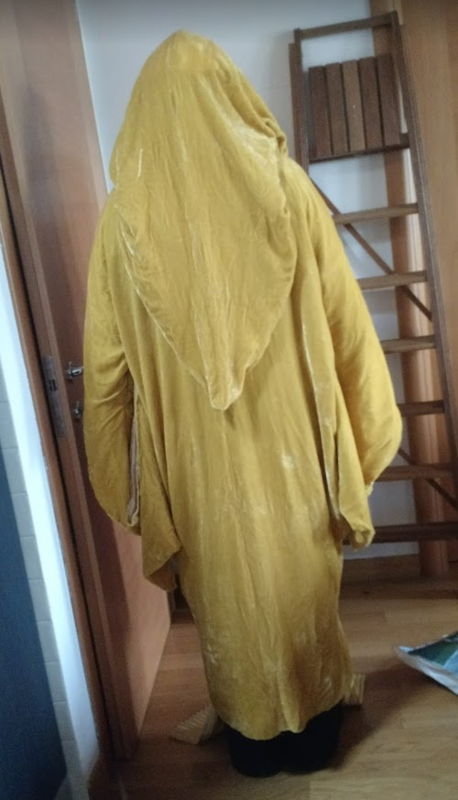 For Star Wars costumes we’re a bit spoiled, there’s Padawan’s guide, there are many CRLs from the official legions, there’s so much that you just have to look at the pictures someone else selected for you. Only few of us actually go back to the movies and see each scene before making the costume. I’ve never been so glad that fiancé bought the complete-nine-disc Collection blu-ray edition. So I went to those ephemeral seconds on which so much of my time would have been spent in the following months. Exhibits pictures are so helpful sometimes. But this time I only had the movie. 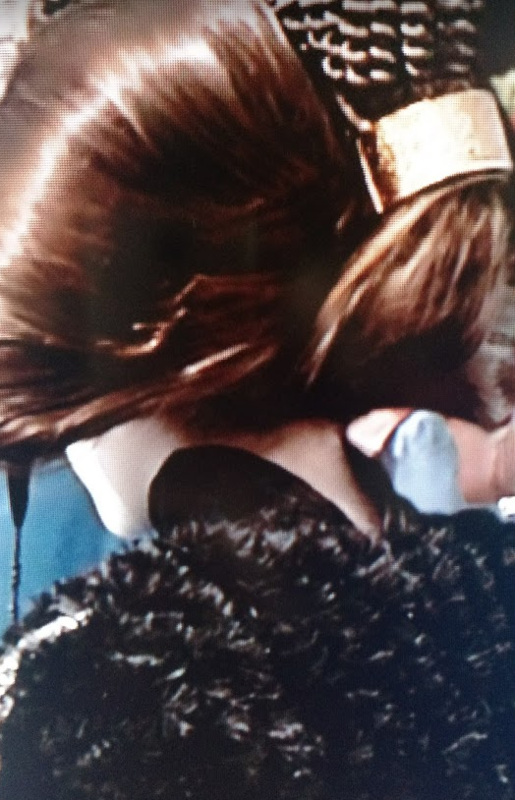 So I screenshot, I enhanced, I zoomed. I compared the design of the embroideries on the fashion show replica, and they were close enouh to be used to fill in the blanks of the pattern. Great bliss was that amazing book that is Dressing a Galaxy. There’s an amazing closeup of one of the sleeve embroideries showing up exactly how they were to be made. the front ones were harder, as they have a different design. 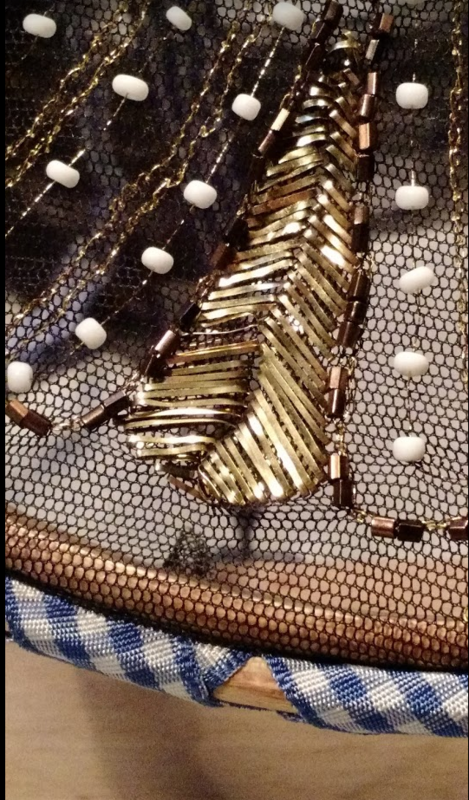 I got quite close for the beads, the main difference is that they used a metallic thread that might have been golden when new, but now has that rosé gold tone of aged gold. Copper was too red, so I went for a warm yellow one. I also had some problems finding the flat metal ribbon, but then it was Christmas, and for Christmas they seel those things at craft shops for those who do not use them in the proper way (“oh, you want to embroider that?” useless to tell them that those were made for embroidery and it was them who misused the thing). 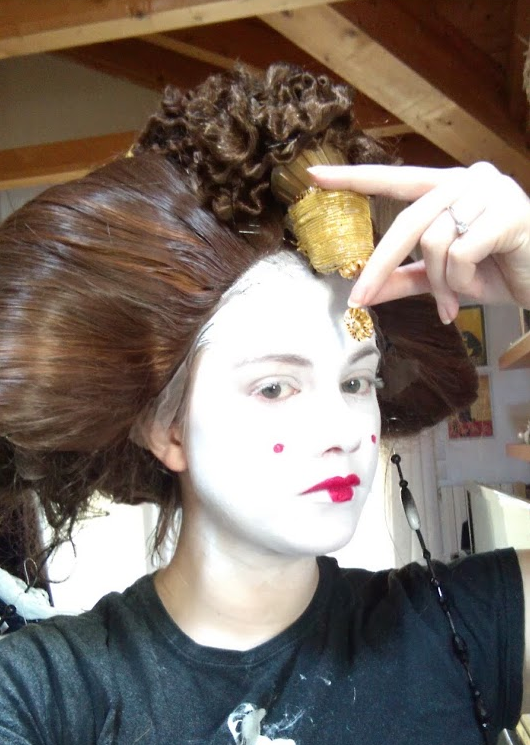 The other challenge were the white and round pearls. they seem to be somehow glazed with spikes. So I took some pearls, took the pearly glaze back with acetone, glued nail art microspheres on each one, and polished the whole thing on top, to get a similar look. I did that for more or less 150 pearls. The embroidered appliques are tambour embroidery. 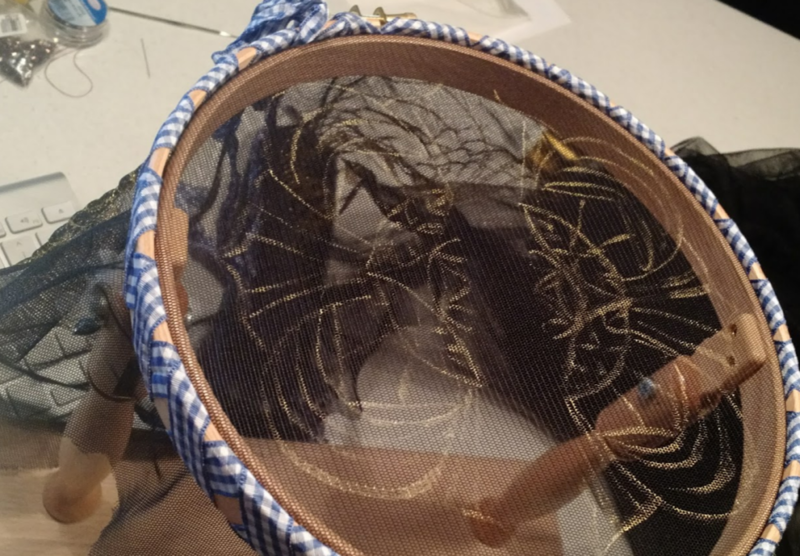 Basically you have to get your embroidery tulle on a stand up embroidery frame, and work the thread with a tiny crochet-like hook. And I did. There are 14 appliques on the whole dress. 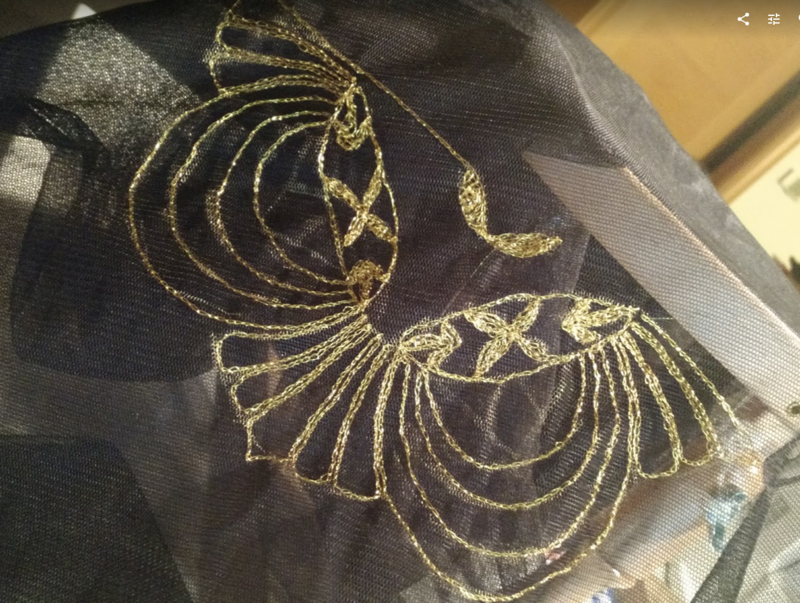 Then I had help adding the small beads on the rays, and then I glued the back, attached them to a black fabric, and added the other missing beads and pearls. The gown has a stiffened collar, open at the back in a V shape, then a sort of velvet beaded bib. Those were quite easy. Less easy were the sleeves, but they came out so stiff that it was worth the effort. There’s an inner silk lining, then there’s a thick denim layer, then padding fabric and finally the long pile minky. You can’t see them very well, but it’s like the fur has been trimmed, or there are some lines sewn on the sleeves only. So I made them, and they help quite a lot in keeping the sleeve in place. Initially we planned to make the non-velvet parts of the gown and the inner sleeves in hand printed velvet. But it didn’t lok right. They write it’s a black and silve brocade, but if it was silver, it would be by far too visible not to come out on the promo pics. 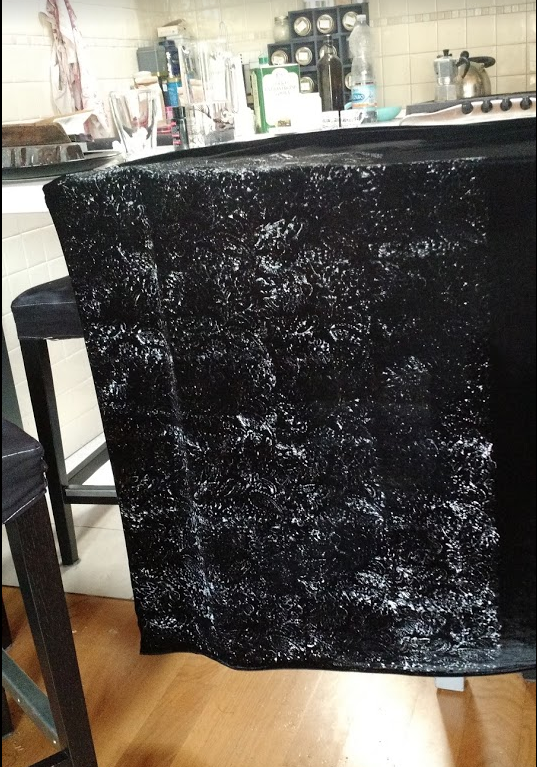 So, after actually hand printing velvet with vintage wooden blocs (you can see the pic below) I got a common black brocade, and it does the trick, in my opinion, better than any silver and black fabric. The main problem was the wig. I can do wigs, but I had to style this three times before making something nice, and I changed the decorations in the process. I think the original ones were made from indian bangles, I have found some that have the identical surface. I got the best of the style with insect screen net as base. I covered it with the first extensions braids I ordered (they were too dark, while the originals were a bit lighter and warmer in color than the base of the wig), backcombed, and then just a lot of pins and hairspray. 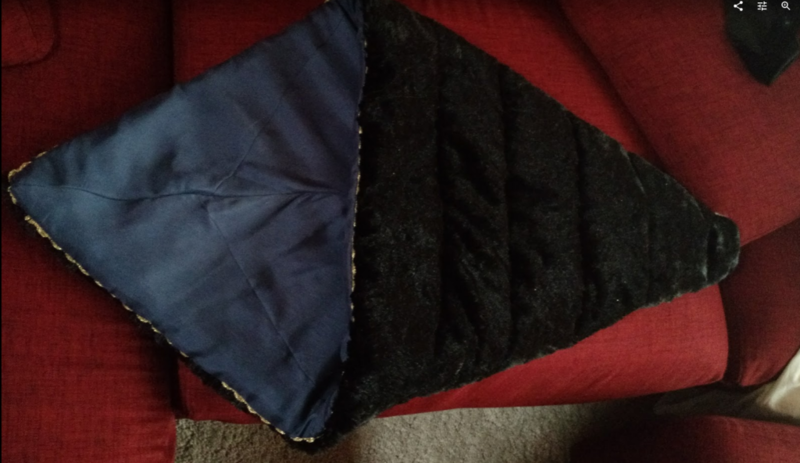 The top cone was in part 3d printed, and then I used one button to close it and an other one thbe attached to the forhead. The two first attempts didn’t have the righ proportions, the sides were too big, you can see in the following pics. It is a front lace, but as soon as my hair will grow a bit longer, I will use them to cover the front, as I think they did with the original one. During all this time, I also worked on the handmaidens. 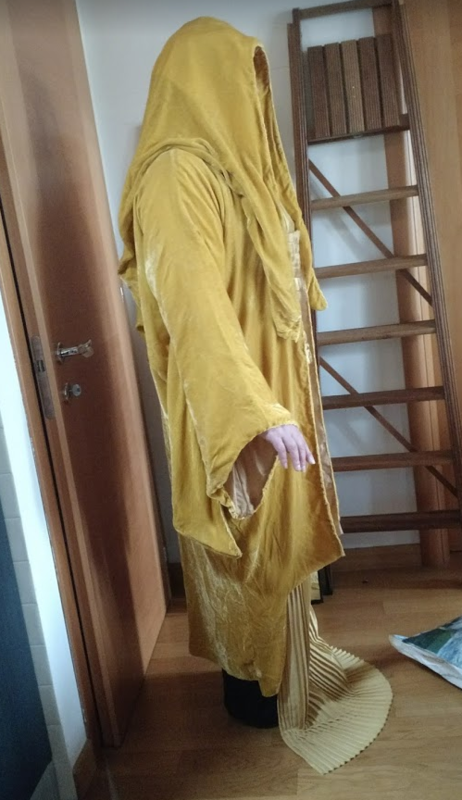 Thy’re made in silk velvet, ordered yellow, and dyed golden by yours truly. We got the design of the prints made in 3d printing, and use it to have identical symbols where needed. This time, from the exhibit The Power of Costume, came a huuuge help. There was the actual pattern for the gown opened wide on a table, and the sketches about the whole inner tunic and sash hanging on a wall. Not that it made easy working with silk velvet. But at least we know they’re accurate. And I’m quite proud to say that the original pattern I drafted before seeing that was 95% identical. We had one problem: the pleated part. You know I have made a fortuny inspired gown not long ago, so I have studied them, I know how it would be. The originals were in silk, but you can’t have a thin silk train to walk around rough surface like basic asphalt. Your gown would last less than one day. It has to be synthetic. We saw the costs of getting fabric box pleated, and we had to skip for this time. We may upgrade the dress at some point. But for now we got some knife pleated satin, we used it on the reverse side, and we added a hoop at the bottom. In the main pictures it was quite windy, and the skirts did inflate like balloons. The not-from-the-phone pictures are by Raska Oberhousen. Costumes, hair, makeup and retouch are by Grimilde Malatesta. 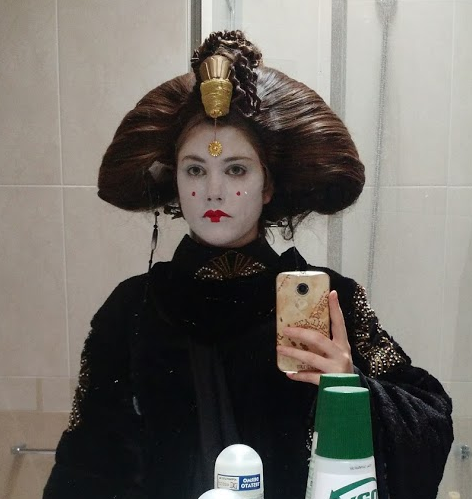 Padmé Amidala: Grimilde Malatesta.